Acetaminophen is the main ingredient of some of the commonly used pain relievers used in the United States. A new study regarding it has revealed a previously unknown side effect  it blunts positive emotions. For this study, the emotional response of participants who took acetaminophen when they saw very pleasant and very disturbing photos was compared to those who took placebos. 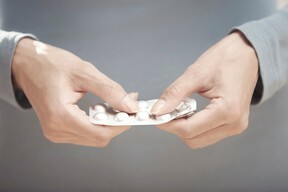 The results of the comparison revealed that those who took acetaminophen exhibited less strong emotions. The study results were published online in the journal Psychological Science. Even though acetaminophen containing pain reliever Tylenol, has been in use in the United States for more than 70 years, but it is the first time that this side effect has been documented. Earlier research had established that acetaminophen works on physical pain as well as psychological pain. This study takes the findings of that research to a whole new level. Geoffrey Durso, lead author of the study and a doctoral student in social psychology at The Ohio State University said that acetaminophen reduces how much users actually feel positive emotions. Durso opined that medicines like Tylenol and other such products have broader consequences than previously thought; it doesn't just act like a pain reliever but also as an all-purpose emotion reliever. Andrew Luttrell, another graduate student in psychology at Ohio State, and Baldwin Way, an assistant professor of psychology at the Ohio State Wexner Medical Center’s Institute for Behavioral Medicine Research along with Durso conducted the study. As per Consumer Healthcare Products Association (CHPA) reports, about 23 percent of American adults use a medicine containing acetaminophen and most of them are not aware about how this medicine can impact their emotions. In order to study the effects of acetaminophen, two studies of college students were carried out. The first involved 82 participants, 50% of whom took an acute dose of 1000 milligrams of acetaminophen and other half took an identical-looking placebo. They then waited 60 minutes for the drug to take effect, after which they were showed 40 photographs selected from International Affective Picture System used by researchers around the world to elicit emotional responses. The photographs were varied and ranged from the extremely unpleasant (crying, malnourished children) to the neutral (a cow in a field) to the very pleasant (young children playing with cats). Participants were asked to rate each and every photo on a scale of -5 (extremely negative) to +5 (extremely positive). They were then asked to view the same photos again and were asked to rate what emotional reaction it evoked on a scale of 0 to 10. The analysis of the results showed that participants who were taking acetaminophen rated the pics less extremely than those who took the placebo that is positive pictures were not seen as positively and negative pictures were not seen as negatively. The analysis of their emotional response yielded similar results. People who took acetaminophen didn’t feel the same highs or lows as did the people who took placebos. It was also noted that neutral pictures were rated similarly irrespective of whether they look the drug or not. To find out if intake of acetaminophen changes how people judge magnitude, the researchers carried out a second study in which 85 participants took part. They saw the same photos and were asked to rate them just like before. Additionally, they were also asked to report how much blue they saw in each photo. The evaluation and emotion response to negative and positive pictures were same as before, however, judgments of blue color content were similar irrespective of whether the participants took acetaminophen or not. The results suggest that acetaminophen affects our emotional evaluations and not our magnitude judgments in general. Whether other pain relievers like ibuprofen and aspirin have the same effect can be a potential research topic.